The surface of a magma ocean. Magma is a primary biome type characterized by vast oceans of deadly lava. Magma planets are an 'inconceivable' threat level, geared toward tier 6 in progression. Not to be confused with the also hot volcanic biome, this biome is primarily lava ocean. Magma planets can only be found orbiting fiery (red) star types. Unless players have a Cooling EPP Upgrade equipped they'll take increasing damage while on the surface from deadly heat. Coming into contact with lava will apply both burning and melting, depleting player health very quickly. An easy method of traveling across the ocean surface is to bring a large supply of water - when water comes into contact with lava it will change the surface of the lava into magmarock which can be safely walked on. The lava found on magma planets is infinite, and cannot be drained. All air below surface level is replaced with lava. To build under the ocean and not have lava spawn inside your structure, you must replace the background and foreground with blocks, then remove the foreground blocks and lava will stop spawning. At night the lava oceans cast a faint glow of light. This dangerously hot planet is chiefly composed of magma. Remember, your resilient spirit is admirable, but it is not flame retardant. The planet surface is dangerously hot. Few creatures eek out an existence amongst the planet's vast oceans of magma. The beam site is a tiny island isolated in a sea of magma. That you would consider visiting this searingly hot planet speaks volumes of your fortitude. The surface layer of magma planets are primarily made up of lava, along with scattered small islands made up of obsidian and ash. Magma planets are mostly covered in lava which spawns endlessly. There's no way to gather all of the lava found in the oceans. Ores can be found on surface islands, including copper, silver ore, gold, aegisalt, ferozium, violium and solarium available in small quantities. Most ore is accessible beneath the ocean floor. Magma surface biomes use their own sets of music tracks for day and night. Magma ocean floor biomes use the Day Tracks plus both Arctic Exploration tracks during the day and the Night Tracks during the night. Magma planets do not have any sub biomes which appear, and magma does not appear as a sub biome on any other planet types. There are no mini-biomes found on the surface or underwater on magma planets. Magma planets deviate somewhat from planetary standards due to being ocean-type planets. Weather on magma planets is either clear with a chance of luminous rain, or clear with a chance of luminous rain, in addition to small or large meteorites. Each magma planet has one of these two pools of weather, and it will not change. Magma planets without a meteorite shower chance will never have meteor shower weather. Chilli plants can be found on magma planets. They'll drop produce and have a chance to drop a seed which can be replanted. In addition to procedurally generated creatures, there are a variety of unique monsters, bugs and critters found in magma biomes. Some of these are also found in other biomes, while others are unique only to magma biomes. While these unique creatures have a chance to appear on magma planets, they will not all appear on each one. In addition to unique creatures, each biome has multiple types of both procedural ground and flying creatures. There are a number of fish which can only be caught on magma planets using a Fishing Rod. These fish won't be seen swimming in the wild without a fishing lure to attract them. A basic fishing rod will not work on magma planets. There are no drops unique on magma planets. 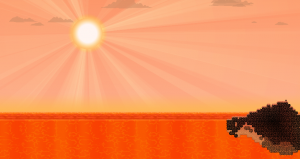 There are no villages or dungeons found on magma planets, they're too harsh to support any type of settlements. - Terraforming a magma planet will not remove the lava ocean nor turn it into water. This page was last modified on 26 February 2018, at 16:18.